For boatbuilders, one of the most attractive qualities of marine composites is their ability to keep overall vessel weight down, especially in comparison to steel. Lightweight composite sandwich structures can assist vessels in lowering their fuel consumption and emission rates without necessarily sacrificing strength and longevity. However, composite vessel sections do not exist in isolation; they often interface with other boat sections, components and equipment. For instance, a yacht owner may wish to drive hooks into the underneath of a GRP deck, from which to hang ceiling panels, or into a composite hull to create fixtures for waterjets. “Unlike composites, there are a lot of standards and reference points when building with metals,” Matthew Stevens, managing director of UK-based bigHead Bonding Fasteners Ltd, tells Ship & Boat International. “There are published rules for steel and aluminium; we know how these materials will behave under certain conditions and strengths, and in certain directions.” For composite components/ structures, though, making alterations after these sections have been built can be detrimental to their integrity. bighead produces a series of fasteners, constructed in 316 marine-grade stainless steel and variable in size (typically featuring a diameter of 13-70mm), and available as threaded male and female variants and hook-type and clip-type units. The fasteners can be applied in two ways. Firstly, they can be embedded in the composite during the construction process, using the mould tool, creating a watertight and airtight seal. Alternatively, should the composite panel already be completed, users can ‘surface bond’ the bigHead fasteners to the panel with an adhesive, gluing it into place rather than screwing it in. 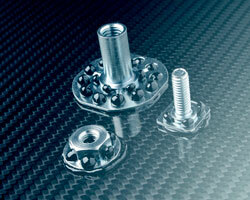 Each fastener has a perforated head, enabling the adhesive to flow through. Whether using the ‘embedded’ or ‘surface bonding’ method, such fasteners can be affixed safely to composite hulls, decks, bulwarks and structures. The straightforward nature of both bonding processes means that vessel owners can seriously play around with interiors and exteriors during the vessel construction phase, using the bigHead solutions to add on “hatches, furnishings, insulation fixings, light clusters and wiring harness supports”, to name but a few applications.